With the exception of FM (stochastic screening), all screens consist of dots arranged in a regular pattern or matrix. The vertical and horizontal distance between successive dot centers is constant and is a function of the screen frequency. When the screen is aligned parallel to the paper edges, the screen angle is said to be 0° or 90°. The rotation angle away from the vertical axis is known as the screen angle. The screen can only be rotated up to 90° before it repeats itself. 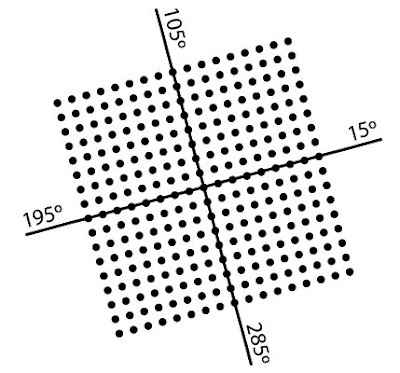 For example, a screen rotated 15° is at the same angle as 105°, 195°, and 285°. A black and white halftone image consists of a single screen. The screen pattern is very noticeable when positioned at 0° and is least visible when rotated 45° as illustrated below. For that reason, black and white halftones are usually printed with 45° angled screens – particularly with coarser screens. The best angle between two screens that is least likely to cause moiré, and is most forgiving to small degrees of error, is 45°. However, in four color process printing, four different screens must be superimposed and all four screens must be angled within the 90° limitation. A set of standard screen angles has been established that is based on a combination of theory and experience. First the least visible color, yellow, is placed at the most visible angle 0° (90°). Then the most visible color, black, is placed at 45°. The cyan and magenta are then placed between these two. Cyan at 15° (105°) and magenta at 75°. These angles represent a best all around compromise for most pictures and represent the standard, most commonly used screen angles. They also form the least objectionable moiré – the rosette pattern (more on rosettes here). Because the Yellow printer is only 15° from the Cyan printer it produces moiré. The visibility of the moiré can be exacerbated if the Yellow becomes contaminated by ink traveling into it from previous press units. 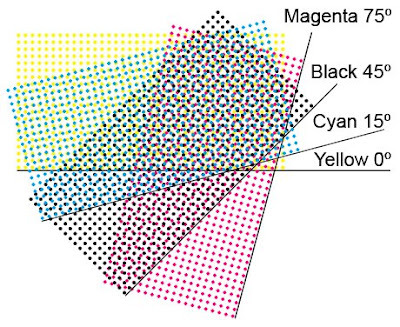 To help reduce the visibility of the Y/C moiré, most screening systems run the Yellow at a slightly higher frequency (lpi) – typically 108% of the frequency of the C, M, and K printers. Left: Yellow at the same frequency as Cyan. 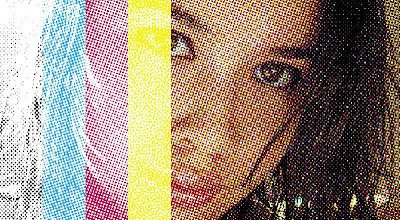 Right: Yellow at a higher frequency to help reduce visible moiré. These standard screen angles are based on analog photomechanical screens and do not work best with electronic screens. At angles other than 0° and 45° a type of moiré patterning within one screen "single channel moiré" may occur. To avoid this problem, some vendors utilize shifted angles of 7.5° to introduce "noise" around the edges of the dots in order to break up and eliminate the visibility of single channel moiré. Most printers will have a standard screen angle set that is used for all their jobs. However, if certain jobs have images where two of the process colors predominate and where those two colors are less than 30 degrees apart, then that screen set should be avoided and a different one used instead. The following screen angle sets are all valid and are in common use. The sequence for the screen sets listed below is C, M, Y, K (i.e. the first screen set on the list is: 15C, 45M, 0Y, 75K). 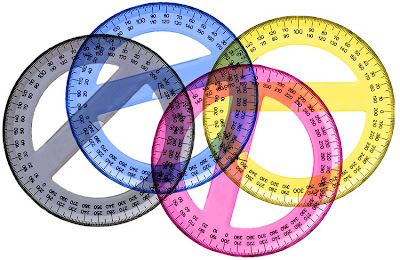 Remember that screen angles have quadratic symmetry so 0 degrees is the same as 90, 180, and 270 degrees. Note that, depending on the original CMYK separation, the Black screen angle may be available to be used for one of the extra colors - V/B, G, or R/O. Interscreen moiré becomes more visible when the angles of any two screens are less than 30 degrees apart. Yellow is usually allowed to be less than 30 degrees because it is such a light color that the moiré is usually not visible. Also, the frequency of the yellow printer is usually made higher than the other three colors (typically around 108% higher) to further minimize the visibility of the moiré. However, the moiré can become more visible if the yellow printer becomes contaminated/dirtied by the preceding process colors, or if its density is too high. Some printers use a coarse FM screen instead of a conventional AM screen for the yellow printer. This eliminates the moiré issue completely since FM screens do not have a fixed frequency or angle. For a 175-200 lpi AM screen an FM screen of about 35 microns would be used since that dot size will have a dot gain similar to the AM screened colors. In certain circumstances, depending on the size of the graphic and the frequency of the halftone, the selected screen angle can distort the accurate rendering of images. 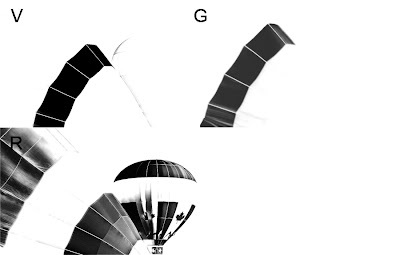 In the below graphic, the halftone screen angle is the same (45º) but the angle of the gray lines have been changed. Note how the screen has affected the rendering of the gray lines at different angles. The artifact at 1, 2, 3, and 4 is referred to as "ribboning" and is fairly common in automobile images. 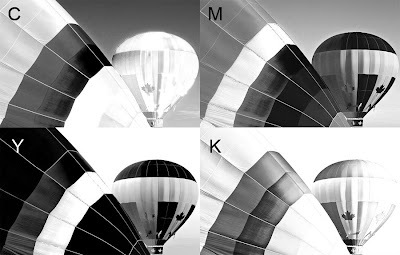 In the below graphic, the halftone screen angles have been changed to the standard 4/C process angles (K 45º, C 15º, M 75º, Y 0º) but the angle of the three gray lines have been kept the same (0º). Ribboning has appeared in the Cyan and Magenta angles while the Black and Yellow angles have caused the appearance of different dotted line effects. 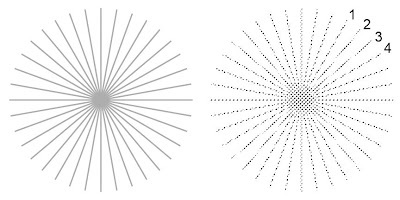 In the below graphic, the halftone screen angle is the same (45º) but the angle of the gray box has been changed in 10º increments. Note how the smoothness of the edges of the box changes as its angle relative to the halftone screen angle changes. The ragged appearance of edge of the last box is referred to as "sawtoothing." Four color CMYK process printing is a good compromise that achieves a wide enough color gamut for most applications while using the minimum number of inks to achieve it. However, sometimes the printer needs to go beyond 4/C in order to achieve a satisfactory rendition of the image. Typically the gamut deficiency will be in the overprint colors - Red/Orange, Blue/Violet, Green. 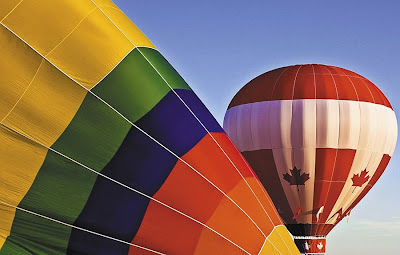 Here is an original RGB image: And here is the CMYK version of it: To restore some of the original color impact, the printer may choose to use "bump" or "touch" plates to boost color back into areas where it was lost. 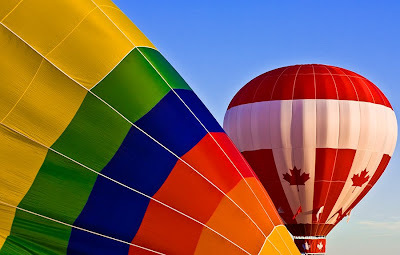 However, adding extra colors causes problems since all possible screen angles have already been used by the C, M, Y, and K printers. 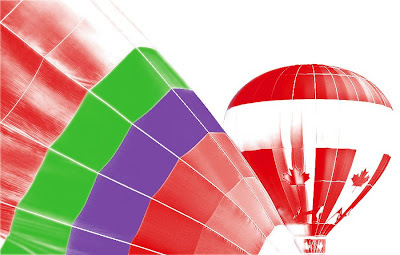 In this example, these are the four channels that make up the image: Note that there is virtually no Cyan in the Red/Orange areas, or Yellow in the Blue/Violet areas, or Magenta in the Green areas. Therefore, those screen angles become available for the extra bump inks. So the trick is to use the screen angles of these unused colors. In this example Violet, Green, and Red: In short, the Violet ink would take the unused Yellow angle, the Green ink would take the unused Magenta angle, and the Red ink would take the unused Cyan angle. Note also that, depending on the original CMYK separation, the Black screen angle may be available to be used for one of the extra colors - V, G, or R.
Really great article! I have been doing mostly just one, two, or three spot color jobs. Everything goes pretty smooth, but at least once a week we seem to get some awful patterns in our one color jobs? Is there any recomendation for screen angles on one color jobs? From reading this it seems 45? Before reading your article I was told that 22.5 was the magic number, but that has not been going to well. Especially with images with a lot of shading/detail. 45° is typical for one color work. I have no idea why 22.5° would be a magic angle - seems very arbitrary. If you're getting patterns - could they be moiré caused by the screen angle conflicting with the subject being reproduced? I'd need more info to help you. Very helpful. Thank you for the information. im using 350 mesh and my exposing time is 280 light units... and my problem is that im loosing my 5% and 10% half tones...does anyone know how i can fix that? Is your system, plates, CTP, etc. qualified by your vendor to do this type of screening? if i use more colors in cmyk process like i want to have a biege color. what should agnle do i use? It's rare that all 4 process colors will be printed with a 5th color. So, you find the process color C, M, Y, or K that is not printing in the area that you want to use the 5th color and use that missing color's angle. How about angle for special colors, spot colors and pantone colors? Check my previous answer on this post. Hi. I am screenprinting a halftone gradient on 280 mesh at 22.5 angle, 35lpi, one color. When the film was put on top of the mesh before exposure, a moire appeared. We rotated the film and found a spot where the moire disappeared. Would that possibly correlate to the 45degree angle you speak of with two patterns? Meaning, the screen mesh is one pattern and the film/artwork is the second pattern? Would love to have your input! Yes, the mesh is one screen pattern angle and the halftone that you're printing is another. So you'll see a moiré when the two patterns are overlaid. But since the mesh doesn't get printed - just the image in the film - there shouldn't be a problem in the final print.